Ella’s Bubbles offer several walk in tubs for two that have two seats so couples can enjoy a relaxing bath together. You will be hard pressed to find these types of walk in tubs for two anywhere else. All of our two seat walk in tubs come with a center door and center drain to make room for the extra seating. We have three types of walk in tubs for two currently; the Companion, the Tub4Two, and the Big4Two. Our first and original walk in tub for two is the Companion. The Companion is an acrylic inward swing walk in tub. It has our original removable stainless steel door with tempered glass. This gives it a sleek look and makes it easier to clean. The Companion comes with the Ella Brand Faucet set which includes the Thermostatic Control Valve . The TCV helps regulate water temperature and prevents scalding hot water from entering the bath. The Companion comes with the option of dual massage (air and hydro jets) or soaking (no jets). It also includes ozone sterilization for cleaning and dual drain technology which allows your tub to drain in 80 seconds with ideal plumbing conditions. It’s size is 30.25” x 59.75” x 37” which is average sized in this industry. Our second walk in tub for two is the Tub4Two. The Tub4Two is an acrylic outward swing walk in tub. One of our first high gloss acrylic outward swing tubs on the market! The outward swing door makes it easier for you and your partner to enter the tub as you won’t have to maneuver around a door. The door includes three latches for more stability and increased strength against the water pressure. This tub also comes with the Ella Brand Faucet set which comes with the TCV. You can also enjoy the hydro jets it comes with for better relaxation. It has dual drain technology for quicker drainage (80 seconds with ideal plumbing conditions). We are excited to soon add other features as well like chromatherapy, ozone sterilization, and more. It’s size is 31.75” x 60” x 42”. This makes it slightly bigger and deeper than the Companion walk-in bathtub. With the extra space and the outward swing door the Tub4Two makes for a more comfortable bath experience. Our last walk in tub for two is the Big4Two. The Big4Two is an acrylic outward swing walk in tub and as the name suggests it is our biggest walk in yub yet. Like the Tub4Two, it is also one of our first high gloss outward swing walk-in bathtub. The outward swing door makes for an easier time getting in. This door also contains 3 latches to provide for stability and strength against the water pressure. The Big4Two sports the Ella Brand Faucet Set that comes with TCV, dual drain technology to drain your tub in 80 seconds(in ideal plumbing conditions), dual massage jetting (air and hydro) to increase your relaxation, and it has ozone sterilization. Its size clocks in at 36” x 80” x 42” which makes for incredibly spacious seating. As you can see in the picture the tub fits a 5′ 2” tall female and a 6′ 2 tall male. They have room on either side of them and enough space to stretch out their feet. If you have the space, the Big4Two could be your best option. Wash away stress and tension in the Ella Big4Two, the largest walk in tub for two available on the market. Boasting enough room to stretch your legs, you and your better half can experience a rejuvenating air, hydro, and foot massage bath whenever the mood strikes. Make the most out of your space with the Ella Tub4Two, a 60” long, walk in tub for two that can easily replace most common standard size bathtubs. This walk-in bathtub provides a more compact bathing solution for couples. 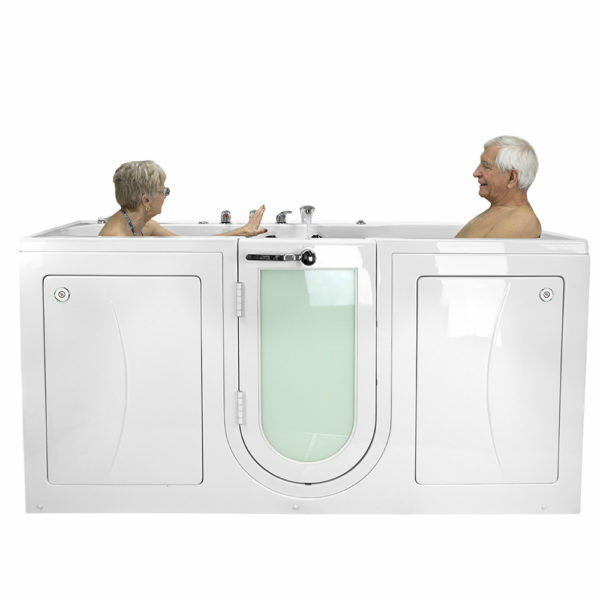 Bathing with your loved one is now possible with the Companion walk in tub. A two-seat version of our classic Deluxe walk in tub, this unique model features a centered outward swing door and center-facing seats.